The song ‘Me and My Baby’ with Margot Memmot as Roxie. Frankie Kovrlija as the nurse. 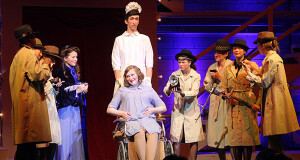 The Dover-Sherborn High School Drama Department presented its rousing spring musical, “Chicago,” on March 14–16 in the school’s Mudge Auditorium. Over 100 talented students were involved in all aspects of the production. From the visible on-stage performances and music to the background technical and business aspects of the show, they produced a shining gift of entertainment that will be remembered for a long time. A fascinating student art exhibition accompanied the play, showcasing excellent student work in various media, such as 2- and 3-dimensional work, acrylic painting, pottery, photography, and transformational drawing. The audience enjoyed viewing the display of student work, both before the play began and during intermission. Another exhibit included behind-the-scenes photos, the research done on aspects of the play, such as makeup and hair, and the models developed from this research for the various characters. As in the historical 1920s, the tipsy rush of jazzy exuberance in the musical had a counterpoint of sensationalized murder, greed, and the cult of celebrity. Without the use of spoken dialogue, the show conveyed many levels of irony and social commentary through sparkling, energetic singing, music, and dancing. While the audience was having a good time, it was forced to consider the motives, choices, and morals of the characters that provided the entertainment. Margo Memmott played Roxie in the March 14 performance with just the right combination of feigned innocence and simultaneous manipulation of others in her world. Margo’s voice was pretty, clear, and expressive. Katherine Roer, as Velma Kelly, was an experienced guide to the jazz era, with a strong voice, command of the stage, and powerful dancing. Aidan Levinson, as Billy Flynn, perfectly conveyed the seamy lawyer chasing celebrity and the money that comes with it. He charmed his way across the stage with a strong voice, polished presence and constant undercurrent of greed and disloyalty. Lila Hovey played Matron “Mama” Horton with a motherly feel, but greedy nature. Her voice was strong and expressive, and she received appreciation and laughs from the audience for her excellent rendition of the character’s vampy songs. The dance ensemble wowed the audience with its sassy jazz hands, energetic, individualized movement, and gorgeous tableau creation in the big numbers, as well as its accomplished embellishment of atmosphere in the smaller scenes. The courtroom scene. 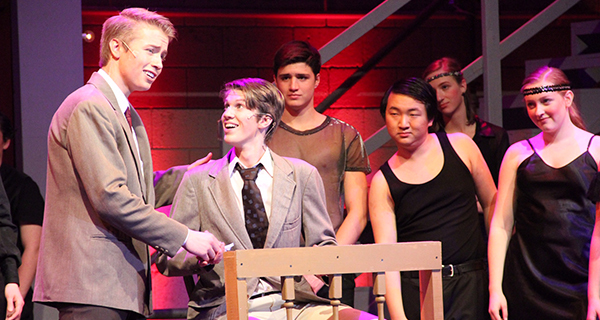 Jack Bowen as Amos, Ben Hodson walker as Billy. Victor Chen, as Amos Hart, and Izzy Taylor, as Mary Sunshine, were both audience favorites for their skilled performances. The students on stage and behind the scenes, as well as the faculty, should be proud of what they accomplished in “Chicago.” Their hard work and determination paid off in a gloriously entertaining production.